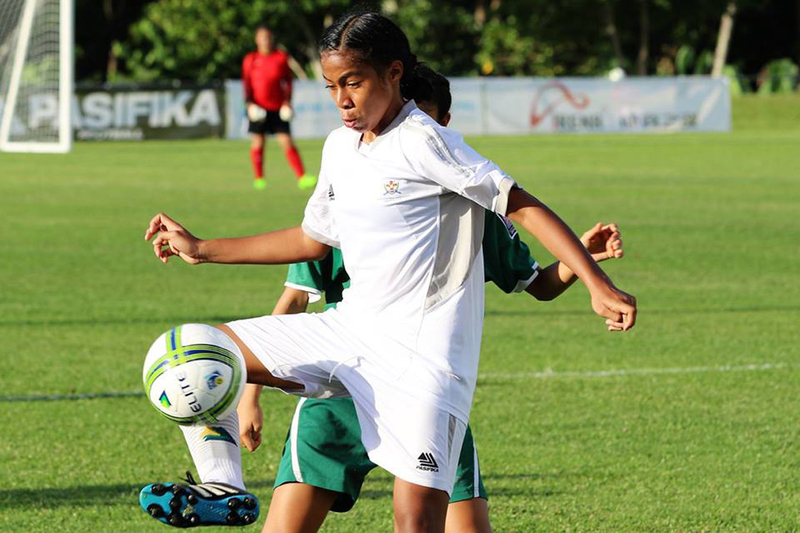 Fiji and Cook Islands have earned an early edge in Group B after defeating American Samoa 4-1 and Tonga 3-1, respectively, on the first day of action at the OFC U-16 Women’s Championship 2017. Although American Samoa threw everything into the milestone match, Fiji’s impressive ball skills and undeniable fitness allowed them to take control of the game and earn the upper hand in the 11th minute with a solid finish from Eseta Sinukula. Viniana Buke – who completely dominated in the midfielded until she was called off to rest in the 62nd minute – was next to find the net after dribbling through three players then carefully placing the attempt just wide of goalkeeper Zena Foma’i. Sinukula followed up with a second goal only three minutes later, profiting from a miscued clearance from the American Samoa backline and giving Fiji a comfortable three goal lead. With their opening match nerves overcome, Fiji started playing a more structured game, holding possession and playing with more patience. American Samoa dropped off and defended deep, however, keeping Fiji out of goal for the remainder of the half. The second half started slow but Fiji coach Marika Rodu’s 54th minute substitute Vani Bainvalu brought the game back to life when she got her name on the scoresheet only six minutes after taking the field. American Samoa’s silver lining came after a hard tackle from Fiji captain Lusiana Lagilevu earned Elcy Naolavoa a free kick just outside Fiji’s penalty box. The American Samoa captain sent in a hard attempt and although goalkeeper Seru Vasuitoga managed to reach it, there was enough weight behind the kick for the rebound to roll over the line. American Samoa coach Ruth Tuato’o was overjoyed with the valiant effort from her team but believed Fiji’s win was well-deserved after their determined performance. “It’s been years since we we’ve been able to send a team to participate in a tournament and this is the first time we’ve sent our youngest team. I’m very proud we’ve how they’ve performed today,” she said. Despite a rocky start and some slow periods throughout the game, Rodu was pleased with the overall performance of his side and is relieved to have secured three points on day one. “I think we’ve started off the competition pretty well. It’s about consistency and we’ll try to maintain the level of our game,” he said. The second match of the game saw a closer competition, but after picking up on Tonga’s defensive errors and finding the back of the net early in the first half, Cook Islands managed to secure the 3-1 win. The opening minutes of the game saw a neck-and-neck battle from both teams but in the 13th minute Ngame Taringa stunned the stadium – and Tonga goalkeeper Kalolaine Topui – with a long range attempt that found the back of the net. Topui managed a hand to the ball, but with the afternoon sun behind it, the catch was misjudged and dropped into goal. Another long-range attempt brought the tally for Cook Islands up to two in the 29th minute – this time from Nathalia Viking, who followed up with another goal only two minutes later. Tonga fought back hard for the remainder of the first half, making the most of captain Seini Lutu’s accurate boot on corner kicks and creating strong combinations up front with Florence Hakalo and Taipaleti Vai, but the determined side were unable to convert before the half-time whistle. Tonga’s long fight was finally rewarded in the 87th minute when Ana Polovili carefully tapped the ball into the back of the net after receiving a perfect pass from Lositika Feke, who had carried the ball the length of the Cook Islands half with an impressive run. Although Tonga coach Lafaele Moala was disappointed with the end result, he was pleased to see an improvement as the match continued and thought his side was unlucky to only find the net once. “Congratulations to the Cook Islands team, they played a quick game, they had good combinations and they worked together. I know my team is good individually but they didn’t work together, especially in the first half. In the second half, they came together and played as a team and that’s how we scored a goal,” he said. Cook Islands coach Theresa Tatuava went into the match prepared for a tough battle with Tonga and although her side managed three goals against them, she credited their Polynesian neighbours for a physical and mental test until the final whistle. “I’m very happy with the way the girls performed in tonight’s game. They went out and did what we asked them to do in the first half and they tried to maintain it,” she said. “The heat and the fatigue set in a bit but they managed to maintain that, dug deep and just kept going so I’m very pleased with their performance overall.